Online regos have now officially closed, however there may be a few vacant spots on the day. So if you still want to come, register below and we'll contact you. If you’re a Uni or TAFE student that wants to get into the startup scene, this event is for you. CBRIN - Canberra's Innovation Network – is a community of innovators and entrepreneurs and home to some of the capital's cutting edge incubators, E29, Griffin Accelator and KILN incubator. Twenty of their top startups in this community are on the lookout for students to join their team. +Build your experience +Access paid internships and part-time roles. As seen on the Shark Tank TV Show - Southern Cross/Ch. 10, Canberra entrepreneur Mick Spencer, CEO of custom sportswear On The Go raised $600K capital from three of the "Sharks" or investors - including tech startup multi-millionaire Steve Baxter. Mick also appeared with Sir Richard Branson at an event for entrepreneurs in 2014. Mick will provide some words of wisdom for students and startups alike at the CBRIN event. Matt Bullock, CEO, Spinify Matt recently sold his online transaction business eWay to US giant Global Payments for US$50M click here Canberra Times article. He started eWay 18 years ago with $50K to his name. Matt will share some of his wisdom in a Q&A speech. We are a Canberra based Cyber Security Coaching and Consulting start-up. We believe that our cybersecurity is our prosperity. We exist to help society defend itself from cyber threats. Fifth Domain specialises in providing Cyber Self-Defence training to both security professionals and everyday internet users because everyone has the right and responsibility to protect themselves in cyberspace. We present our students with course materials, action plans and simulated exercises to evolve their ability to recognise, respond to and overcome cyber adversaries. It's a people problem requiring a people solution. Fifth Domain coaches people to be that solution. Agile Digital are an expert software consulting & production house who have been dedicated to crafting high stakes digital solutions for over ten years. Our reputation for successful system delivery spans major high-traffic web platforms, mobile apps, business workflow systems and control systems for mission critical data centres. Our experts leverage practices from Agile & Lean development methodologies to go beyond the fundamentals of technical excellence, with an agile approach that targets great product design and rewarding user experiences. CoachLive offers products and services for athlete performance tracking. Wollemi delivers software products and services for energy management and other periphery applications. In addition, Wollemi is also a co-developer for a range of startups, we analyse a business prospects for success and then offer software engineering services in exchange for an equity stake.) Wollemi delivers software products and services for energy management and other periphery applications. In addition, Wollemi is also a co-developer for a range of startups, we analyse a business prospects for success and then offer software engineering services in exchange for an equity stake. Ecospectral has developed a wireless sensing and control system called BRIM that is used in buildings to analyse space and energy usage. Our platform is complete from sesnor to cloud including advanced predictive analytics. Spinify is a new company from one of Canberra's most successful entrepreneurs Matt Bullock. It is a gamified approach to incentivising sales people by effortlessly managing sales commissions, motivating staff, and paying them faster. Coolamon Advisors have the experience and capability to assist Government and Commercial Organisations to deliver greater value to Indigenous Australians. We understand the diversity that exists across Indigenous Australia, the complexity that this creates for Government’s policy and delivery responsibilities and we have a proven ability to deliver innovative solutions and provide valuable expertise to meet these challenges. Health Horizon All the world's health innovations in one place. Making them searchable and trackable. Clearz is a specialised consulting/technology company that develops bespoke software that captures data on Defence ships, helicopters and bases. We are currently developing and supporting 7 major Defence systems that track military preparedness and are now moving into the mobile development and data capture space. Exciting times. Defence is a challenging and complex environment and there is lots of room for smart innovative people to really make a difference. Oakton Canberra is different and deliberately so. We have got the stability of an experienced and respected national consultancy firm with the agility of a technology focused team which is innovative and stacked full of top talent. This means we get to work on some of the most challenging projects in government and deliver technical solutions that help make significant improvements to the lives of Australians. Threesides works with businesses to create results through smart marketing planning and implementation. We help you get more customers to your business with our digital first approach to integrated marketing. Our mission is to lead the transformation of government services to deliver a better experience for Australians. The Digital Transformation Office (or DTO) has been created - to work closely with government agencies, users and private sector partners to create public services that are simpler, clearer and faster. Datacom Technical Security Services (TSS) was established in 2010 by former Australian Government cyber security and intelligence specialists. Our backgrounds cover threat prevention, information security, capability development and countering cyber exploitation. We provide Managed Security Services, Security Consulting and Security Testing services to a broad range of industry sectors throughout Australia and NZ. ANU Sport is a not-for-profit organisation that provides students, staff, alumni and affiliates of The Australian National University with an extensive range of sporting, fitness, recreation and well-being opportunities. ANU Sport are currently looking to create a stronger media presence through the development of a number of new and existing digital platforms. Infinite is an experienced and established Internet Service Provider & Web Development firm focusing on specialised Internet for business. We are a team of hard working, Internet enthusiastic Canberrans. Since 2003, we have become one of Canberra’s leading Internet Service Providers (ISP) through exceptional customer service and innovative solutions. We offer a range of services from network and server infrastructure, through to web development and applications. As we manage our own core network, our own infrastructure and we develop our own websites and applications; we can create custom solutions for our clients that go beyond the standard web layer. InterfereX is building advanced content delivery software solutions to overcome congestion and improve video quality. [Digital Marketing Specialists]((http://privateimarketing.com/). As a Google Partner we focus on Google Analytics and Google Advertisement (Display and YouTube). Rockstars and Royalty designs and makes elaborate, vintage-inspired gowns and have been established in Canberra since 2008. We are now expanding and creating an online range of highly customisable dress designs. We are looking to create a website featuring a dynamic, interactive design section that allows customers to customise each design to exactly how they want it. We have huge ambitions and plan to become an internationally recognised brand. We are looking for talented, creative tech designers and programmers to join our team. Dilkara Essence Of Australia is an Indigenous inspired hair care and skin care range. Our Dilkara mission is to supply quality, Australian made products with organic ingredients that are sourced straight from the Australian bush to you. We support sustainability in Indigenous communities whilst offering you the authentic Australian Dilkara Experience every time. Anti Grabbity is a removable, transparent balcony safety device to help prevent small children from climbing over balconies and intoxicated adults from engaging in risky behavior. 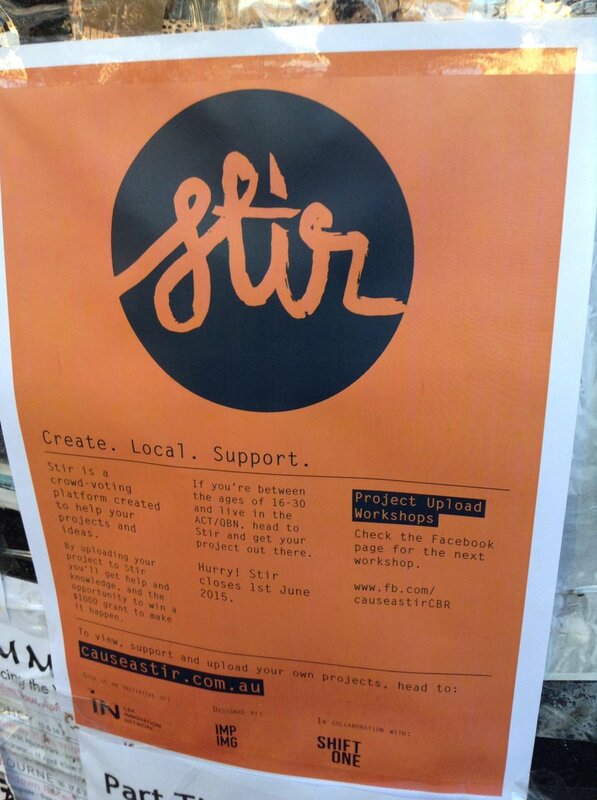 [Canberra's crowd voted micro-grants platform]((http://causeastir.com.au/ ) for creative projects. Stir provides a platform to develop passions into project proposals by providing education, exposure and the potential for funding. SignOnSite is a work health and safety software platform disrupting the construction industry. We work with advanced location services that allow workers to sign on and off sites automatically, enabling a suite of safety and management tools on site. SignOnSite is the first app for the workers on site and is poised to revolutionise the industry from the bottom up. What is Quizling? Play, create, share and learn through quizzes. Quizling has partnered with some of Australia’s finest museums and institutions to bring you challenging and engaging quizzes on all sorts of topics! New quizzes shared weekly! Have fun, learn and help your child achieve! LabHero is a platform to connect researchers and participants, and helps coordinate meeting times and payment. TKBT produces Prose, legal drafting software that allows lawyers to draft contracts faster, with more integrity, and produce a better result. Stakone - Improve your ability to manage staff effectively. mHITs (pronounced Em-HITS) is a multi-award winning Australian FinTec company that develops and operates mobile payment services. In Australia, mHITs operates the mHITs SMS payment service that allows consumers to send and receive payments by SMS text message. mHITs is also working in emerging markets in the design, deployment and operation of mobile payment solutions for the so called “unbanked” (people who do not have access to traditional banking services). mHITs has received multiple awards for innovation both within Australia and Internationally. Get It Sorted is an online portal which helps consumers find services they require at a time and place which suits them. Whether it be a doctor, plumber, PT or hairdresser, just to name a few, Get It Sorted finds service providers who are willing and able to meet the consumers’ demands. Having owned and run hospitality venues for over 10 years, I was sick of advertising online to consumers I couldn’t help, be it my product or timeframe didn’t meet their requirements. Consumers waste time searching, businesses waste money advertising, but with Get It Sorted, all this will change.